Every evening around 5PM the big white thunderheads begin to form and cling to the mountains of granite that surrounded Lhasa. They grow and begin to darken as the evening lengthens, then the lightening flashes and the thunder roars and the rain begins to fall…but mostly the lightening and thunder. Built in a long fairly narrow valley, Lhasa has remained a manageable size; although the urban sprawl is apparent when you look at the town from a high point, say the roof of a temple. There are few skyscrapers. Most new building are keeping somewhat to the spirit of the older buildings of Lhasa, built with blocks of granite, split by hand, and then plastered. There seem to government grants available if a developer builds in the old style…well, almost in the old style. The old style involved a large interior courtyard with interior balconies on each flight, where the real life of the building was carried on. Not so the new apartment buildings, they are being build in a solid block…no support for community life here. Getting around Lhasa is easy. There is little traffic, some taxis and working vehicles and private cars…but mostly people move around in a “lickshaw”, a seat for two, gaily decorated, pulled by a bicycle driven by a man wearing a vest with an identification on the back (we saw women drivers of lickshaws in Chengdu, but not here). There are many lickshaws, and relatively few autos, such that the lickshaws set the pace of traffic making for a less frenetic pace of life out in the street. As in Chengdu, the drivers pedal their buggies right out into the middle of traffic, making seemingly wild and dangerous u-turns. Yet there are few accidents, and people are going slowly enough that the accidents that happen are minor. One lickshaw that I was in plowed into a car that turned in front of it…both drivers were distracted ……it was clear to me we would collide and I grabbed a hold of both support bars. Collide we did, and came to a stop right in front of a military base. Unlike the accident in Chengdu when Joe opened the door just as a taxi sped by (both drivers screaming, crowd gathers, police come) both drivers were very quiet. The lickshaw driver, I suspect, expecting the worse, just stood and hung his head. The driver of the car apologized over and over. A group of perhaps seven men gathered, no one mentioned calling the police. After the crash I had jumped out of the cart, and just stood quietly, as the lickshaw driver looked at the ground and sweated. No one even looked closely at the damage to the car door. We separated as quickly as we collided. Walking around Lhasa you see such beautiful people, easily distinguishable as to their tribal group. Beautiful bronze skin tones, tall and graceful people, wearing rich colored shirts under their long dresses. Very regal. Life goes on in all of the small lanes that connect up the larger streets. The lanes are jammed with people selling everything…a pile of shoes aside flats of beautiful brown eggs, then Disney-like clocks and fabrics, someone cooking pork buns or hot-dogs on a stick…everyone eating, most all of the time. School age kids pass by, bouncing basketballs, wearing their school uniforms and behaving like kids anywhere in the world. Time moves slowly here, with many hours spent hanging out and eating meals. Small groups of men hunker down over dice or card games in the back alleyways…all of this life style visible as you wheel by in the back of a lickshaw. The children here in Tibet are wonderful. The babies are out in society with family members…they begin working along side their parents from a young age…this is a very different situation than is seen in China, where they are in their 3rd generation of the “one child policy”…or the spoiled child policy. In Tibet, for the Tibetans, there is no one-child policy. However, for the Chinese people living and working here the one child policy applies. You see many babies with the pants split open at the crotch…some with little behinds showing through, others with disposable diapers. The use of plastic bags in Lhasa has been forbidden, and with some success. Most purchases are placed in bags made of a light fabric. The indestructible disposable diaper presents another dilemma. Visiting the Portala Palace was disturbing as well as amazing. It is an incredible building for sure, first built in the 7th century AD as a palace for King Gampo, the current incarnation of the building started in 1645 during the reign of the 5th Dali Lama…it took 50 years and the hard work of countless people to build. Today it is a museum, the current Dali Lama having taken flight in 1959. There are over 2000 rooms in the palace, and the public is allowed to walk through (or be herded through) maybe 30 of these. Several of the rooms house the pure gold tombs of earlier Dali Lamas. Some of the tombs contain over 5,000 kilos of gold, and are encrusted with huge gemstones of incalculable value. The rooms are stuffed with Buddha’s, many life size, others gigantic, and thousands upon thousands of smaller statues. The rooms also contain honeycomb like wall shelving with copies of the commandments and the commitments, sometimes written in gold…hundreds and hundreds of them. It is hard not to wonder what was going on in the heads of the Lamas when they made these tombs of gold when the population outside of the temple was starving. And even today, as Tibetans pass through these rooms, they toss money onto the overflowing piles of bills at the base of many statues. Where the money goes today I have no idea, but the blind obedience of the people seems as strong today as ever. The many Lamas one sees walking along the street do not seem to be deeply spiritual, there with their gold watches and cell phones and dark glasses. While I am sure many of the Monasteries have a strong healthy spiritual practice ongoing currently, there is a hollow feel to today’s religious practice as it is felt on the streets Lhasa. The Jokhang Temple, built 1300 hundred years ago, is the center of religious life today in Lhasa (many photograph taken here are in the slide show). It reminded me of visiting churches today in Italy, the priest up front with maybe 5 rows of old women dressed in black praying away, while tours are being led inside the church, the group leader speaking with a microphone….meanwhile Italian men gather just inside the door of the church, smoking cigarettes and chatting loudly. Here in Lhasa the tourists are intermingled with the pilgrims, who have come from all over Tibet. Many pilgrims walk round and round the temple, many prostrating themselves as they go. The vast majority of the pilgrims are old, and I think the majority are women. The accumulation of wealth by the temples, as with the Vatican, has just always seemed hypocritical at best…religion as a business. Easier to become a monk than get a job. When I went to the Portala Palace Joe and Hai-xiang visited an orphanage just outside of town and took the kids all kinds of sporting equipment and pens, paper etc. Seems like a far more charitable way to behave then stuffing the temple with gold and gems. On Saturday we drove out to the sacred Namtso Lake where we made a small ceremony for Shary Farr’s brother Brad, who had recently died. And, as requested by Boo, we tossed a piece of Monterey Jade far out into the lake. Joe rode a yak, and we enjoyed the lovely scenery at the lake, a very serene and holy site. Apparently it had rained all morning, which is the time of the arrival of the many busloads of tourists. However, when we arrived the rain had stopped and the sun shone through the clouds. We seem to be having good luck such as this on our trip. The drive out to the lake was beautiful. Tibet has had more rain than is usual, and the rivers have overflowed their banks in many places. Water comes gushing and rushing down each watershed, making vast swamplands. I don’t think I have ever seen true nomadic peoples before yesterday. There they were, out enjoying summer pasture with their goats, sheep, cows and yaks. The yaks are really great looking, big and shaggy, mostly black, some with white patches (we discuss how to get a yak at home). They appear to be docile. It was the goats that were head butting and pushing each other around. It was hard to figure out what was going on with the sheering, the goats and sheep being in all states of shorn ness. Another vehicle of interest is the ever-present multi-purpose tractor, a 2-cylinder, belt driven, hand cranked diesel, You see them out plowing in the fields, carrying large loads from one place to another, or carrying the whole extended family along to whatever destination. It’s one world for sure. You can’t stop or turn back the hands of time, and it is hard to know for how many more years the nomadic life style will carry on. The cell phone, cell phone reception and cell phone towers exist everywhere. One little girl up at the encampment at the lake which caters to the daily influx of tourists and pilgrims, held tight proudly to a western style baby doll. The big advertisements, and the Chinese go for advertising in a big way, all feature western, usually blond haired blue-eyes women. All that keeps me from being horrified by the amount of advertising is that much of it is in Chinese characters, which look very artistic to me…it is only on inquiring of Xaing that I learn that beautiful lettering written on walls etc. are ads. The nomadic people take their animals to pasture in the summer months, and in the cold weather they return down to the lower elevations in the valleys. A tough way of life. Hard hard work with few comforts. But the family ties are strong and seem to be the center that holds everything together. There is the young man with the old grandmother on the back of the motorbike. A peak inside a tent and a child is chasing a goat outside of the tent. As in the rest of China, people spend much time cooking and eating; eating in the street, at the desk in the hotel, in the restaurant. People seem happy. People seem filthy… the nomadic people have a life style where bathing has no role. People feel gentle and strong. In the city there are many “dudes” that one would rather not meet out on the street after dark, an undercurrent of desperation and ill-will even…..disgruntled youth. We did a lot of shopping in Tibet, as will become apparent come Christmas time. Hai-Xiang has decided he had better come back to California to join us for the Holidays to take part in the festivities. Our last morning in Lhasa we dashed to the market to pick up a few last minute items. Walking down the street Hai-Xiang picked up something silver lying on the road…….a lovely moon. So we now have the moon in pocket as we accompany her across the skies. Leaving Tibet I lost my notebook with all my notes of our visit to the rooftop of the world. I did not return to writing up our Tibet trip for many many days, and already we were well into the next series of adventures…..hard to go backwards in time in this dynamic fast moving forward land of China. Tibetan chapter remains unfinished. But a few last topics to touch upon. The Travel Industry…… They have an incredible stranglehold on the Chinese people as well as on visitors to China. When people want to travel to Tibet they are told they must work through a travel agent and buy a Tibetan Travel Permit. This mysterious permit is never asked for by anyone in Tibet. Usually people are coming to Tibet (or to a Chinese tourist destination) are traveling as part of a tour. If not traveling as part of a tour people often is told they must hire and pay for in advance a private tour guide. The tour guides then scalp the travelers further, demanding money for this and that. If the clients get uppity and call the tour company to complain, they discover that the guide has already been paid for whatever service they are currently demanding pay. The whole system is just an incredible racket. In terms of the traveling Chinese public, they travel in tour groups…you see them everywhere, with the tour leader carrying a little colored flag. If there is information to share with the group, the leader bellows through an electric megaphone, even if it would be easy enough for people to hear an un-amplified voice. The Chinese love to hear how large the park is and how high the mountain is and any other such statistical facts the guide may have to share. They move around in these huge groups, in hundreds of buses, in and out of restaurants and hotels, waiting and lining up and waiting some more….they seem to accept this as the way one sees the sights. Their patience is remarkable. Only once have we seen open rebellion break out among the tour traveling public. 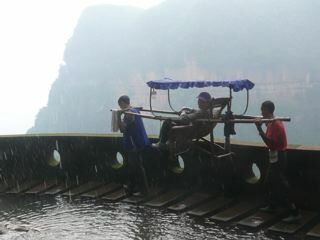 See the letter from Joe to the Chinese tourism department for our brief encounter with this mode of travel. When we arrived in Tibet the harvest was just getting underway. The ongoing rain this summer was making for a difficult harvest as the grain needs to be kept dry after being cut. All of the harvesting we saw in Tibet and have since seen going on in Sichuan Province has been done by hand. People bending over with sickle in hand, cutting the crops and arranging them in stacks of all shapes and sizes. Sichuan Province is extremely productive, rich soil, plenty of sunshine and water, mile after mile after mile of farmland, and not one mechanical harvester.